I honestly couldn’t think of a better title. Because, these are, well… just random pictures of food! I was cleaning up my computer and found some photos I’d taken when I’d gone to Bali last year.I found 3 pictures of food (yeah, I took just 3 measly photos out of all the fabulous stuff we ate… But Iwasn’t blogging then.) Nothing phancy, but I still thought I’d share. We stayed at a place called Villa Waru, and breakfast everyday consisted of pancakes, toast, eggs made to order, and lots of beautiful local fruit. And of course, Balinese coffee. Yellow watermelon...who'd have thunk it? 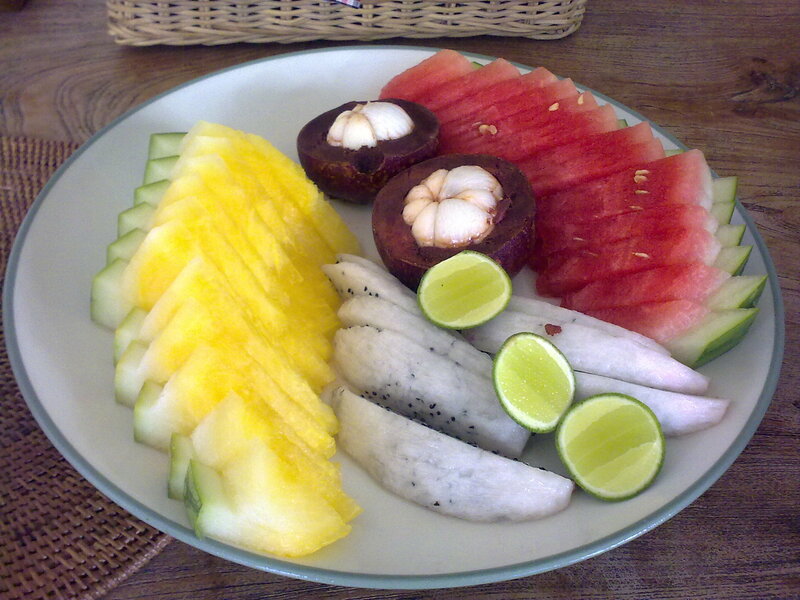 Here’s one of the breakfast fruit plates. They had yellow watermelon!! And here’s dessert from one night. 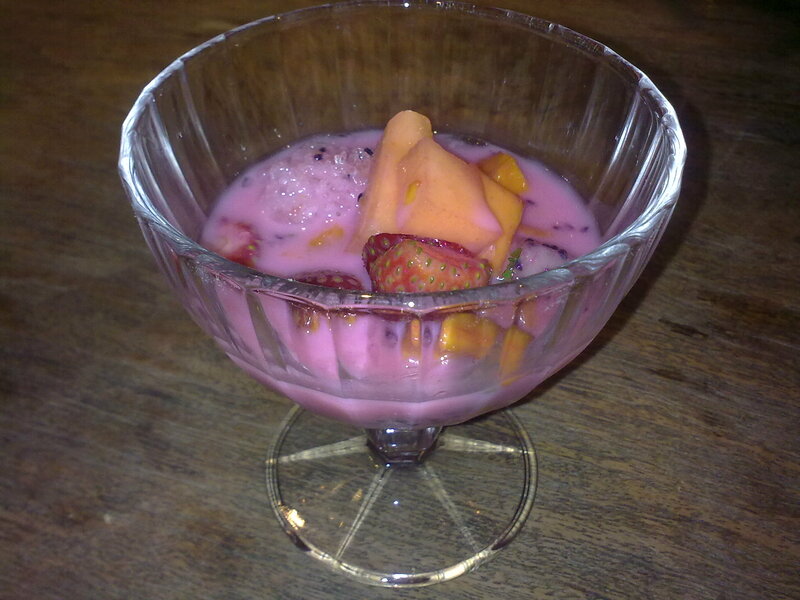 There was an iced fruit salad, with crushed ice, strawberries, and a thin, custardy-concoction infused with rose essence. 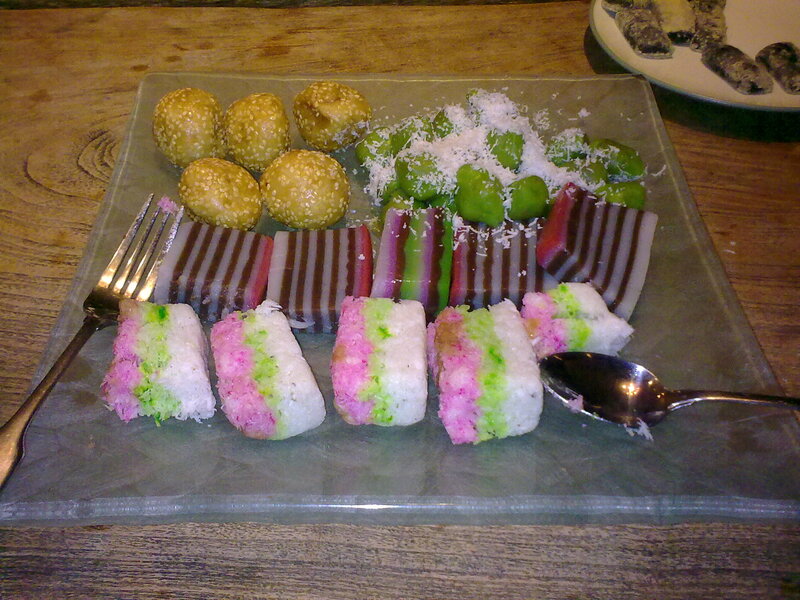 The last pic I have is of a dessert platter- all kinds of Balinese sweets made with sugar and coconut. The striped sweet was a lot like the Calicut-style halwa we get back in Kerala, but less greasy. And the green, pink and white layered sweet was a gelatinous coconut barfi. Yummy!